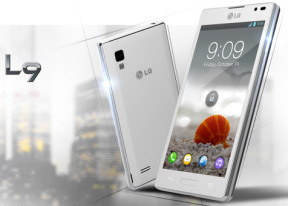 LG Optimus L9 is powered by the TI OMAP 4430 chipset with two 1GHz ARM Cortex-A9 CPU cores and the PowerVR SGX540. Sure, the L9 hardware is not the benchmark champion of every geek's dreams, but it's nowhere near the end of its lifecycle. In fact, it's more than adequate for the price range. Anyway, let's take a look how this one stacks among the competition. Benchmark Pi is a simple single-threaded benchmark, so we know what we can expect from it. The Optimus L9 falls behind the Krait-powered and the latest quad-core smartphones, but comes close to its Cortex-A9 CPU siblings - the Galaxy S II and the Galaxy Nexus. Linpack offers multithreaded benchmarking, making it essential for testing dual and quad-core beasts. The Optimus L9 stacks the same as its dual-core siblings - the Galaxy S II and Galaxy Nexus. Quadrant is a composite benchmark (it tests CPU, GPU and I/O). The LG Optimus L9 scored almost the same as the Samsung Galaxy S II, beats the Galaxy Nexus but was outrun by the Galaxy Note, Xperia S and naturally, all the quad-core beasts. Another worthy composite benchmarks are AnTuTu and GeekBench. Here are the results. The Optimus L9 uses the PowerVR SGX540 GPU and has a qHD screen to fill with pixels. Obviously that's a pretty tall order, which explains the rather poor showing in NenaMark 2. The L9 result is comparable with the Xperia S, but that one uses a 720p screen. GLBenchmark isn't particularly kind to the Optimus L9, either, but the smartphone can take consolation in the fact that it matches the HTC One X result. We're using the Egypt test in offscreen 1080p mode so that results are directly comparable even though each device has a different screen resolution. The Vellamo score isn't too bad either. We only have the results of quad-core smartphones to compare the L9 performance to, but the difference isn't too huge, which bodes well for the LG mid-ranger. Overall, the LG Optimus L9 is hardly the most powerful smartphone around and there are certainly be plenty of devices out there to give you faster ride around Android. However, it's no slouch either and it's raw power will be more than enough for the vast majority of the users.